Dark brow nearly opaque amber color. Strong full head slightly off white in a creamy caramel color. A well defined layer a lace keeps to the edge of the glass. Smell is sharp with dark tones of glazes and roast. A hidden blend of malt and sugars. Whiffs up the nose remind me of past lives. A smooth pleasant taste which leaves the mouth eager for the next. Feel is import of fizz and tingyness that results from sugary alcohol. Very drinkable. Another great Trappist. Poured in a 30cl chalice. A: Cloudy dark-brown with one-finger head. Medium carbonation. S: Yeasty, dark malts, alcoholic, slight notes of citrus and spices. T: Bready and malty, dark malts. Sweet in the beginning, transitioning to yeasty and a faint hop taste. Also, some dark fruits in the mix. A complex ensemble of flavors going on. Temperature is a huge factor! O: I really like the complex flavor profile! Definitely one of my favorite dubbels. If I had to critique something, is that it doesn't have that "Je ne sais quoi." that would make it a superb beer! I absolutely hate it that it has taken so long to try the Achel beers. I haven't had a trappist ale that I haven't liked yet. The beer explodes as it hits the bottom of the goblet with very active carbonation, and a volcanic head froms and prevents the 10 oz of beer from fully decanting. A deep burgundy hue with mild haze retains the foamstand well while leaivng an abundance of lacing on the glass. An ideal look for a Dubbel. Candi-coated pilsner malts create a mouth-watering effect through sheer aromatics. Fruited with raisons, figs, dates, prunes, grapes, and apples. All with a sweet confectionate scent. Mild alcohol tart aromas blend well with phenolic peppery, spicy notes. Again, this all fits with the best Dubbels. The candi-coated barley flavor continues well into the flavors and delivers a sugar cookie flavor with fruit punch esters and spicy, tart yeastiness that again, compiments the alcohols very well. Very round and complex flavors that come close to quinching my expectations of boldness- somehow, I want more. As the carbonation promises, the beer is full, round and rich; expanding in the mouth with a dry, cotton-candy like sweetness. As the sweetness evaporates, the dryness and powdery textures make the beer whisp away effortlessly. A light coating of residual sweetness rests on the surfaces of the mouth. This is one terrific beer; certainly fitting the high expectations of Trappist Dubbels. At 8% ABV, this is a Belgian Dark Strong, not a Dubbel. Belgian Dark Strong Ales are dark, very rich, and complex. Most versions are unique in character reflecting characteristics of individual breweries. Authentic Trappist versions tend to be drier than Abbey versions, which can be rather sweet and full-bodied. 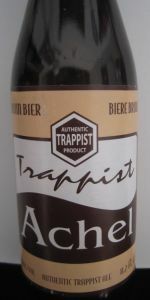 Although Achel is authentic Trappist, it drinks more like an Abby. It has a rich chocolate/munich malt character and aromas with a lingering sweetness. Very smooth tasting with a medium-heavy mouthfeel throughout. I bought an 11.2oz bottle at Red Spirits & Wine AND BEER! on January 19, 2015. The date on the bottle was July 16, 2014, making it 6 months old. I can't fault this beer to style. I tend to like my Belgian Strongs a bit drier, but this was very easy to drink and enjoyable. Worth a try! i like this even better than their tripel, and even though i paid 17 bucks for a single smell bottle at highland tap and burger, i dont regret it. ive been meaning to try this one for awhile, as it represents one of the last trappist offerings i have yet to get into. im so glad i did, its amazing, as good as any of the others. raisin brownish red with over two inches of tan head, airy and foamy, rising above the rim of the glass even, and lasting the entire drink. it smells amazing, an old world yeast strain, something very special there, and a nice long boilded caramelized malt profile, but stopping well short of that chocolate malt depth you would find in a brown ale. this is more of a dubbel, with fruit like fig and raisin to it, and a moderate sweetness all the way through. a little molasses, vanilla, alcohol warmth. some nice white pepper and clove spice from the yeast, but its all just so well integrated, very impressive. smooth in the feel, effervescent on the carbonation, and creamy, sort of rich and regal feeling, infinitely satisfying and dangerously drinkable for its strength (and price). an extraordinarily complex and impressive beer, as good as any of the trappist stuff. one of the great beers of the old world, not to be missed. Okay beer, a bit more on the malty side rather than yeasty (bread). Small sting of alcohol in it. Not thick and syrupy. Not my favourite trappist. Sampled at Zotte in Amsterdam, Hooland. Pleasantly aromatic, very subtle, milk chocolate and a fairly intense dark fruitiness. Intensely fruity, cloying at times, pleasing at others. Soft, velvety backround. Mellow, woven fruit flavors of plums, mixes berries, orange and grape. The fruit flavor in this beer was stupendous. What was missing was the big, malty chocolate and caramel backround that I have come to expect in dark Belgians. With a little tweaking of the recipe, I can't imagine this beers dominance. Pours a nice purple-brown color with a good off white head. Nice lacing spots. Nose brings dark sugars with a tiny amount of roast as well as spice and a bit of booze. The taste is raisins, dates, other dark fruits as well as caramelized sugar, some booze, and caramel. Nice medium mouthfeel with low-ish carbonation. Drinks quite well. Good, not great, beer. 33 cl bottle poured into my Corsendonk tulip. Appearance: A head that's completely indomitable, sitting like ice cream at the top of the glass. As it slowly goes down the lacing's thick and sticks fiercely to the sides. Body is a hazy brown with amber and red hues shooting through it. Just a total perfect looking brew in my eyes. Smell: Initial spicy citrus bite in the nose, some heavy lemon zest, slight cream and vanilla, slight maple. Along with that comes the darker fruits, though instead of taking their place as the dominant aroma, they're really more in the back, doing nothing but complimenting everything else at the forefront. For fruit I'm getting cherries, plum, and dark berries. All red fruits with dark skin. Also now I'm getting, with some deep inhaling, clove, ginger, and cinnamon. Almost like what pumpkin ales that don't stack up try to achieve with their spices, though somehow Achel, as a Dubbel, achieves this. I am utterly impressed beyond belief for a Dubbel; this is insane. Taste: Dark fruit comes out at first, with the citrus zest coming in behind, then leaving the yeast and a bit of hop bitterness (I think, though it could be the yeast also) to balance it all out. Alcohol is slightly present, but is well hidden. Lots of fruit, yeast, citrus, and almost some chocolate-like flavors come in at the end. Not as complex as the aroma, which is why it's getting a 4.5 from me, but it's damn close. Mouthfeel: Silky smooth, rich body, creamy finish. Yeasty (which is welcoming for me) toward the end of the glass. Drinkability: What a damn good beer. It's slightly expensive (around $5 a bottle), so until I actually have a real job and am out of grad school I won't be buying tons of it, but this is without a doubt my favorite Dubbel, and I recommend it very highly, style or not. This Trappist was not quite as dark as its Belgian Trappist counterparts. However, don't judge by that. It is a sweet, extremely smooth, and delicate beer. It gets better as is warms, and is a beer best drank after a meal, when you can just relax with it. The head was not anything to particularly write home about (I do own a goblet glass for these specialties). However, the caramel-coffee smell was very savory, and hard to put down after a drink. It is a strong beer, but the sweetness of it masks the alcohol content nicely. Personally, I think it is the best out of the Trappist Breweries, and is not overly expensive. Served in a Trappistes Rochefort chalice at cellar temperature. I opted to swirl in the sediment towards the middle of this tasting. Appearance- Tawny to brown in the "biere brune" tradition, very murky with a thick, heavy look. Head begins at just under an inch and slowly fades to a thin mat, with the most miniscule bubbles hugging the inside of my glass. Minimal lacing. Smell- dark fruity notes with a malt driven nose, with a slight indication of phenols and candy sugar. Sweet prunes, raisins come to mind. Alcohol level (8%) is apparent without much imagining. As the beer approaches 40 minutes in the glass (how did that happen?)... the aromas meld and become more complex and impressive. Taste- Begins with a good integration of malts and dark fruit, with a mild alcohol suggestion at the very back. Hops are clearly evident in the finish, joined with a banana-like character and bready, bitter finish. Plummy and sweet, dry on the palate between mouthfuls. Mouthfeel/Drinkability- Sublime in the mouth, the perfect blend of cream and foam. Medium weight, perfect for the flavors going on within. This drinks great over a long, unhurried hour when all you desire is rest and contemplation. A-- moderate pour got a huge 3 finger light brown head. Slowly died down to just under a finger. Good head retention and some small carbonation beads. Color is more of a muddy ruby grape color. S-- Grape, bubblegum, poached plum and pear. A little bit of hop spice to offset the sweetness of this. T-- Stewed plums and cherries. Very hearty and almost jam like. M-- Spice still cuts down on the sweetness of this. More it sits in mouth the bubble gum taste comes back more as well as the poached plum and pear that are not really in the taste. A bit high in carbonation and maybe that is a good thing as this would be very jammy if it was lower carbonated. Gives it more of a candy type taste and feel with more carbonation. D-- Really scary how drinkable this is. A little sweet and carbonated, but reminds me a lot of La Chouffe Nice and their Brune. ABV is very well hidden and can drink a 750 without even thinking about it. More I think about it does remind me a lot of carbonated grape soda. YUM!